Do your product launches take markets by storm? 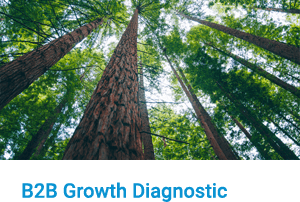 Do your teams follow a proven roadmap… one that precisely “tunes” digital media, sales tools, lead-generating offers, and more to each specific market? They will with LaunchStar training and software… the world’s premier B2B product launch methodology. Remember the 4 Ps we borrowed from consumer goods marketers… product, price, place & promotion? A better B2B approach is to launch the Right Product to the Right Market (who to tell) with the Right Message (what to tell) using the Right Media (how to tell). And using this sequence ensures a cost-effective launch, since you won’t waste agency fees pursuing the parts you should own: “who” and “what” to tell. The rules for reaching B2B prospects are changing fast: In 80% of B2B transactions prospects now find suppliers, not the other way around. If you’re not more internet “findable” than competitors, it’s likely “game over” for you. But don’t ignore proven traditional methods, such as trade shows and sales visits. LaunchStar® software guides your teams through a process we pioneered to customize the best promotional methods to each market segment. 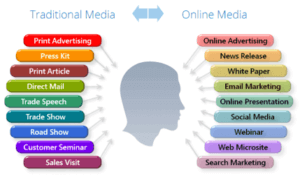 Teams select just the right balance of methods from 9 traditional and 9 online media. Without this, your teams will overspend and underperform. Your multi-functional teams will use cloud-based LaunchStar® software to collaborate on all their launch planning. They’ll use it to build a work plan… manage a budget… plan sales tools and training… track metrics… set up lead qualification… and much more. They can even plan global launches with regional nuances. There’s nothing missing. They’ll finish with a comprehensive Executive Summary Launch Plan to gain launch approval. You can even link this team-support software to your enterprise stage-and-gate software to save double-entry by teams. 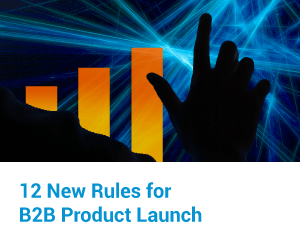 Download this e-book by Dan Adams to learn the principle behind dynamic B2B product launches. This is the same as our in-house training. Bring home LaunchStar® software and e-learning… and check it out on one of your new product launches.